Almost a year ago, Microsoft had made Ubuntu available for download from its Store. Now, the Redmond giant has made Kali Linux distribution available for download that can be installed by all Windows 10 users from its Microsoft Store. For those unaware, Kali Linux is a free, and open-source Linux-based operating system designed for digital forensics, penetration testing, reversing, and security auditing. Kali allows you to download a range of security related programs such as Metasploit, Nmap, Armitage, Burp, and much more that can be used to test your network for security loops. It can run natively when installed on a computer’s hard disk, can be booted from a live CD or live USB, or it can run within a virtual machine. 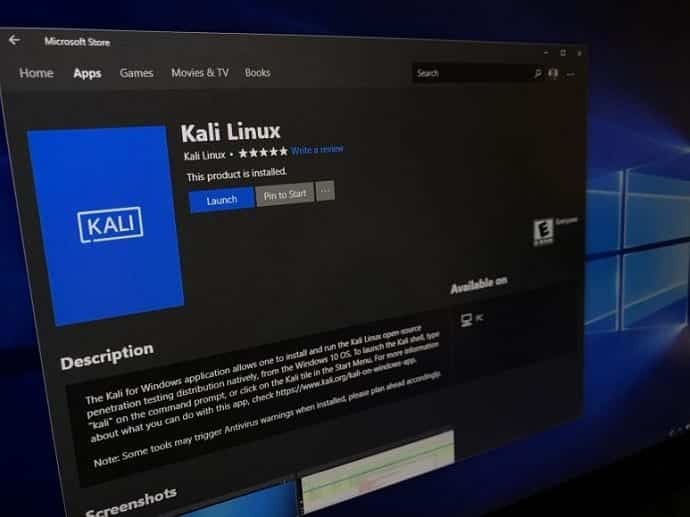 However, in order to use Kali, you will first need to install the Windows Subsystem for Linux (WSL) from the Windows Features control panel. Once installed, you need to enable the WSL feature on Windows 10. To do this, you need to open PowerShell as Administrator and run the “Enable-WindowsOptionalFeature -Online -FeatureName Microsoft-Windows-Subsystem-Linux” command. Once done, you need to restart your computer. To install Kali, click on the app here from Microsoft Store. Once Kali is installed, type “kali” on the command prompt to launch the Kali shell, or click on the Kali tile in the Start Menu. You can also run Kali Linux on Windows 10 in docker. Yeah but this is not the full OS right? I imagine that it will only let you execute some terminal commands and install Linux apps. That’s more or less what happened with Ubuntu on Windows at least.